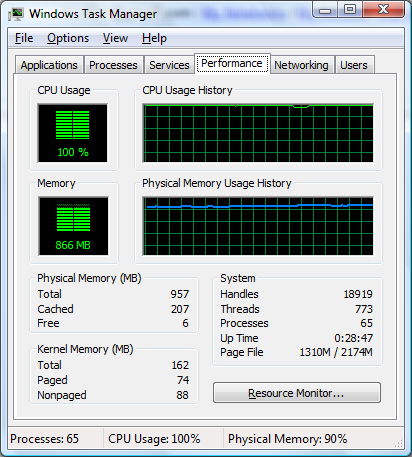 My 2-year-old computer was getting a bit slow, as I now run a lot of programs simultaneously. For Christmas, I received an AMD Athlon 64 X2 5000+ and 2GB of RAM, which was a welcome upgrade. The RAM installed without any problems (at first). It took a good amount of force to snap the DIMMs in place, but the RAM worked. Vista instantly recognized it, and rated it as a 4.8. I installed the CPU without any physical problems – but the system would not boot afterwards. It powered up with the fans spinning, but didn't POST. No beeps, nothing. I tried clearing the CMOS – that made the system beep at least. I identified the beeps as being an error with the RAM. 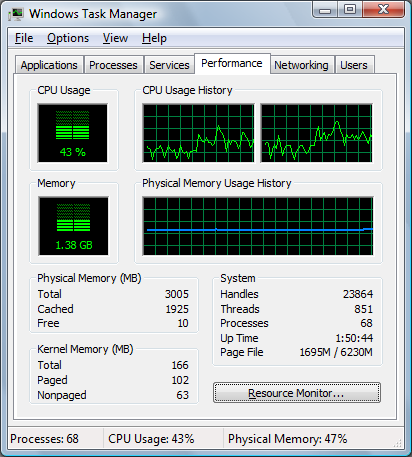 By removing all RAM sticks but one 512MB one, I was able to get the system to POST, and begin booting into Windows. (The CPU was correctly recognized by the BIOS). I managed to get 1GB of RAM to work by installing the two 512MB sticks into slots 1 and 3 (so it ran in single-channel mode). I could not get any of the new RAM to work, no matter what I tried. So I booted into XP and installed HP's 3.10 BIOS update. I rebooted. No beeps upon reboot, and the POST screen displayed the new BIOS version. I installed all of my RAM and booted up. It worked! I see you had some trouble with upgrading. What about Linux? Does it work now? Have you tried a memory test (like the one on the Kubuntu CD)?